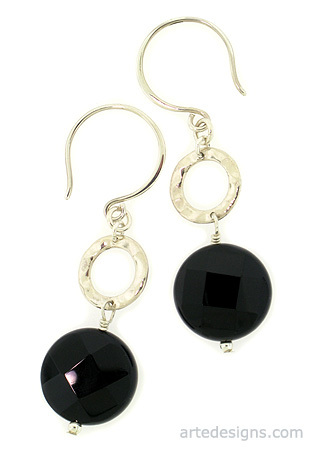 Faceted round black onyx gemstones pair up with hammered sterling silver circles to create these modish and chic earrings. Black Onyx is known to help release negative emotions such as sorrow and grief. It is used to end unhappy or bothersome relationships. Onyx jewelry is worn to defend against negativity that is directed at you. Approximately 2 inches long. Sterling silver wires.